We had an abundance of perfectly ripe apricots a while back and whipped this up to celebrate. Baking fruit on top of puff pastry, with some ground almonds and a dusting of sugar is dead easy plus it brings out all the flavours and enhances the deliciousness. Wine Suggestion: we think that these flavours go well with southern French botrytised wines, especially from Semillon and Sauvignon. Don’t go all out with a top named Sauternes Chateau as these will be too concentrated and rich, rather find smaller Chateau, second wines or little appellations like Cérons. Look for a purity of fruit and balance of freshness, but a lightness of being and not too rich. Preheat oven to 220°C/Gas 7/Fan 200°C. Unroll the pastry onto a slightly damp baking tray and sprinkle over the almonds. 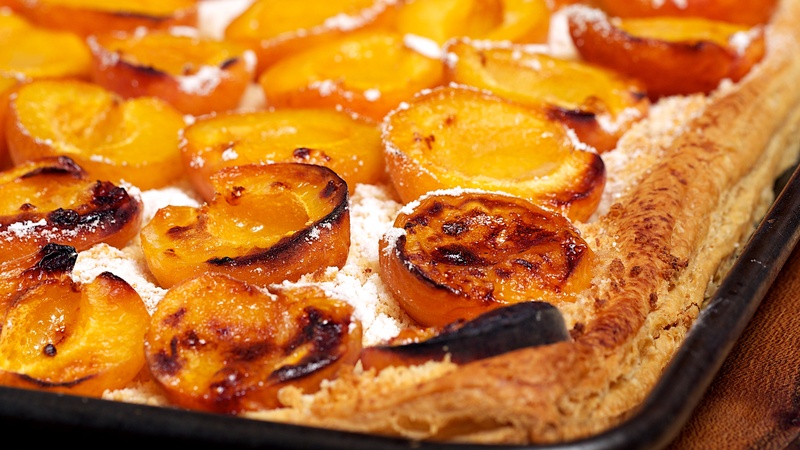 Arrange the apricots on top, tightly packed and right up to the edges of the pastry. Dust with the icing sugar and bake for 20-25 minutes or until the sugar has started to caramelise. Serve hot or warm with a drizzle of maple syrup and some cream if you like. If you have some ready-rolled puff pastry in the freezer and a few leftovers in the fridge you can make an easy and delicious tart for supper. My friends might have been more impressed if they hadn’t seen me assemble it in 3 minutes flat before turfing it into the oven! Try this with anything you fancy on the top, though a bit of cheese is a must. Peel the onions and cut into wedges. Put them into a shallow pan with the butter and cook over a fairly low heat until they are soft, golden and sticky. This will probably take about 40 minutes or so. Heat the oven to 220ºC/Gas 7. Unroll the pastry onto a lightly floured baking tray. Score a border about 2cm from each edge and prick all over with a fork. Tip the onions on to the pastry, pushing them almost to the border. Brush the rim with some melted butter or some of the onion butter if there is some left in the pan. Slice the cheese thinly, then break it into small pieces, and distribute these through the onions. Scatter over some picked thyme leaves. Bake for 15-20 minutes or until the pastry is puffed and golden. Wine Suggestion: this calls for a white wine from the mountains: try an oaked Chardonnay from the Jura or if you want something amazing look out for the “Vigna della Oche” Riserva from Fattoria San Lorenzo in the Marche, Italy; a fantastic and truly amazing Verdicchio – a white wine that lasts a decade or two and just becomes more and more complex and complete. This is easy peasy and looks so impressive. You need a rectangular tart tin with a removable bottom. We used a long thin one 12cm x 34cm. For the crumb base, melt the butter in a small saucepan. Crush the biscuits to a coarse powder in a food processor (or bash them in a bag with a rolling pin). Mix the crumbs with the butter, then spoon into the tart tin and smooth them into into the corners and up the sides. Press firmly but don’t try not to compact them too much. Stick the base in the fridge until it has set. To make the filling, separate the egg, put the yolk in a bowl with the sugar and beat for a few seconds to mix. Beat in the mascarpone until you have a custard-coloured cream. Stir in a few drops of vanilla extract. With a clean whisk and a clean bowl, beat the egg white until it stands stiff, then fold it into the creamed mascarpone. Spoon the mascarpone into base. Hull the strawberries, slice them thinly and arrange them on the top. Put the tart back in the fridge but remove it about 20 minutes before serving. Drink with: a glass of Moscato d’Asti – lightly sparkling and deliciously sweet and fruity. Don’t be put off by the copious amounts of garlic as they are mild and sweet by the time this delicious tart by Yotam Ottolenghi is cooked. It is perfect for a dinner party as you can have it cooked in advance and just reheat to serve. 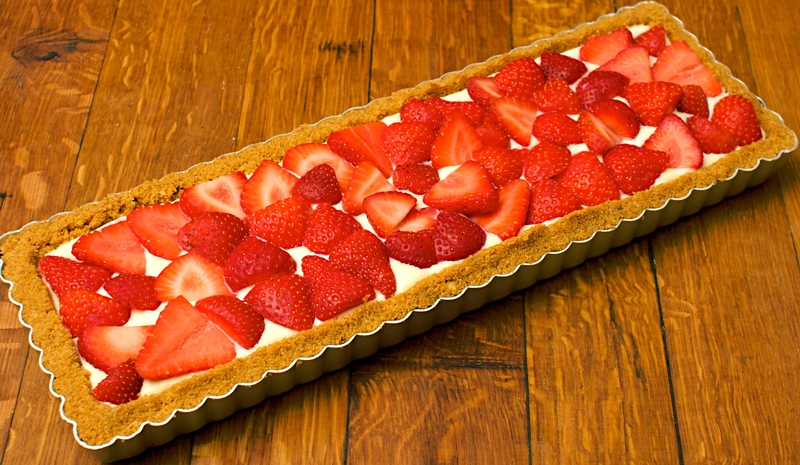 You will need a shallow, loose-bottomed, 28cm fluted tart tin. Roll out the pastry into a circle that will line the bottom and sides of the tin, plus a little extra. Line the tin with the pastry, place a large circle of greaseproof paper on the bottom and fill up with baking beans. Rest in the fridge for about 20 minutes. Preheat the oven to 180ºC/Gas Mark 4. Put the tart in the oven and bake blind for 20 minutes. Take the beans and the paper out and bake for another 5-10 minutes or until the pastry is golden. Don’t panic if it puffs up in the middle it will deflate as it cools down. Set the tart case aside and leave the oven on. While the tart case is baking, put the garlic cloves in a small saucepan and cover with plenty of water. Bring to a simmer and blanch the garlic for 3 minutes, then drain well. Dry the saucepan, put the cloves back in and add the olive oil. Fry the garlic on a high heat for a couple of minutes. Add the balsamic vinegar and water and bring to the boil, then simmer gently for 10 minutes. Add the sugar, rosemary, thyme and ¼ tsp salt. Simmer for another 10 minutes or so on a medium heat, or until the liquid has almost evaporated and the garlic is coated in a dark syrup. Set the garlic aside. 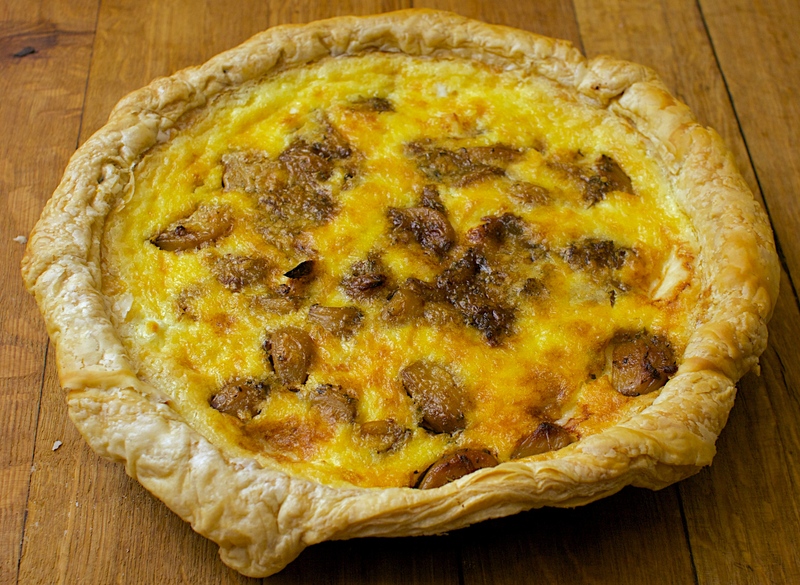 Break up the cheeses and scatter pieces into the pastry case. Spoon over the garlic and syrup. Whisk the eggs, creams, ½ tsp salt and some black pepper together in a jug. Pour this over the tart filling to fill the gaps, make sure you still have cheese and garlic poking up through. Turn the oven down to 160ºC/Gas Mark 3 and put the tart in. Bake for 35-45 minutes or until the filling is set and the top is nicely browned. Remove from the oven and leave to cool a little before taking it out of the tin. You might need to trim the pastry edge. Serve warm with a green salad. 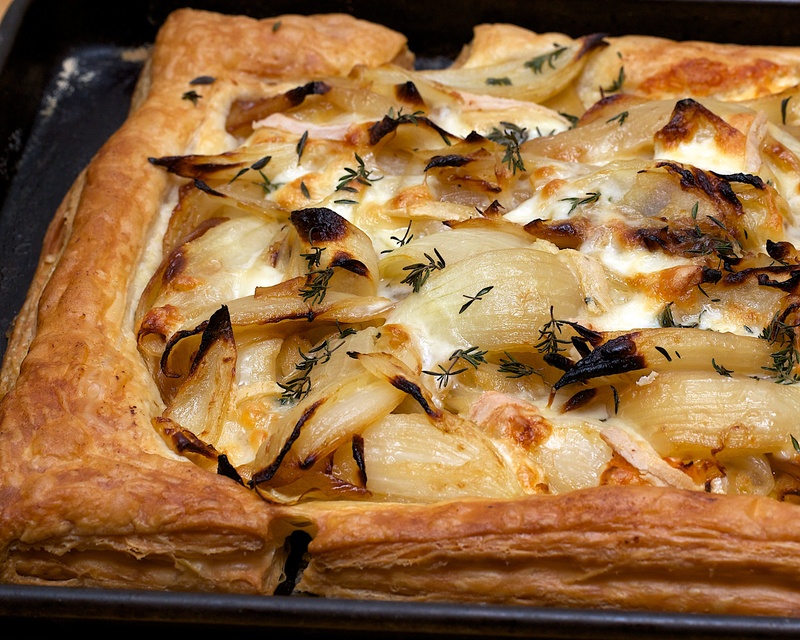 Wine Suggestion: This combination of dairy products and pastry demands a white with good body and moderate acidity. A Rhone white that uses one, or a combination of Roussanne, Marsanne and a little Viognier would work well, but avoid most 100% Viognier wines as the acidity won’t be great enough. We drank a Hermitage white which combined the first two of these grapes to good effect and provided an excellent complimentary texture.